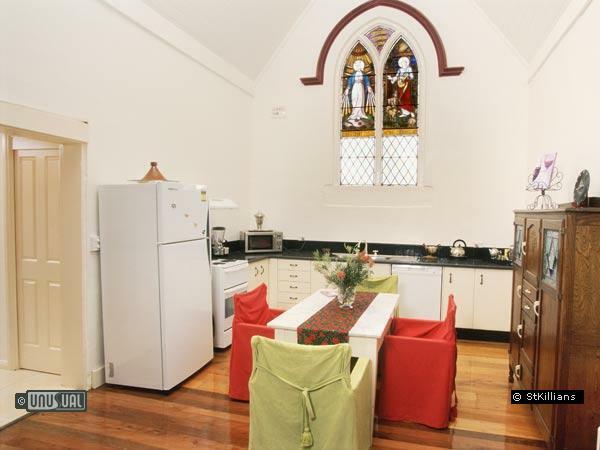 Tastefully restored church, now a romantic getaway for couples including personal chef. 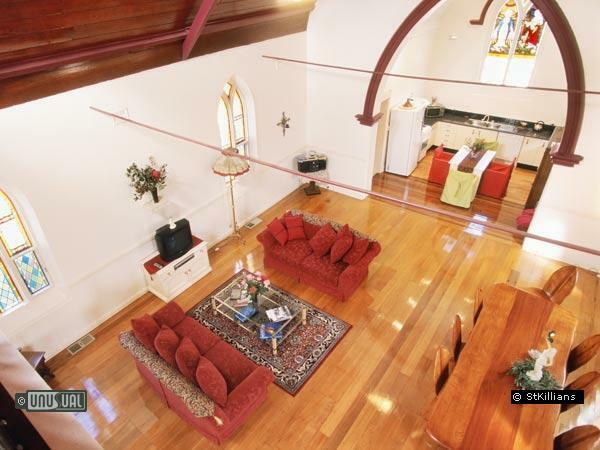 St Killians is a Historic Church that has been beautifully restored. Guests have their own personal Chef for the duration of their stay and are pampered from Sunrise to Sundown. 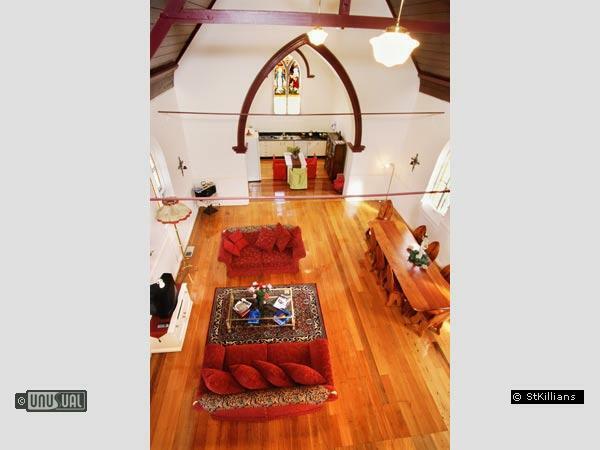 St Killians also organize small weddings, intimate receptions and themed dinner parties. "Elegance, luxury and a rare ambience . . . 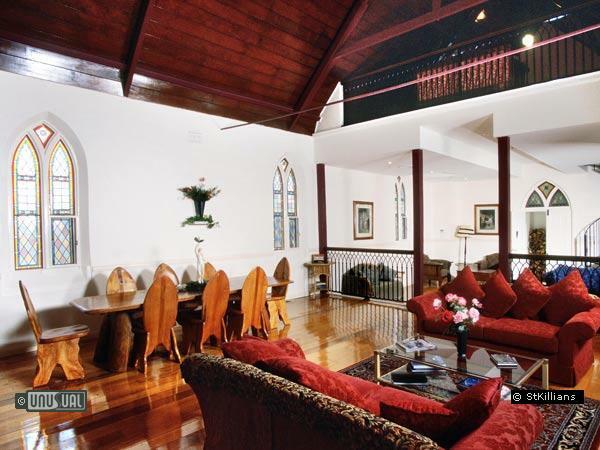 This nineteenth-century former church, set in a picturesque hamlet in the Hunter Valley, offers guests a pampered and very private getaway. After its stylish renovation, a sojourn at St Killians offers you a unique adventure in luxurious relaxation, and fine food. 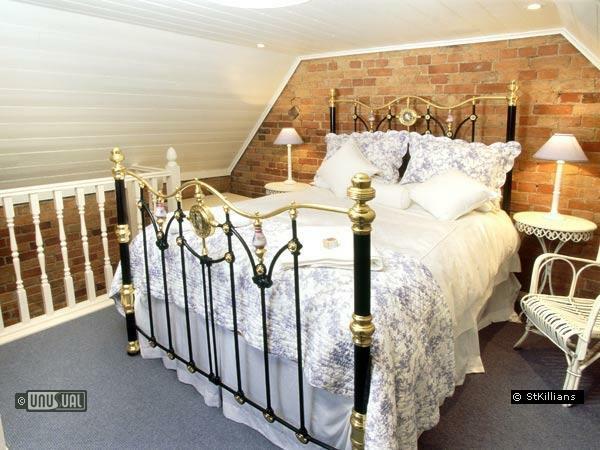 Guests choose between two superbly decorated loft bedrooms. 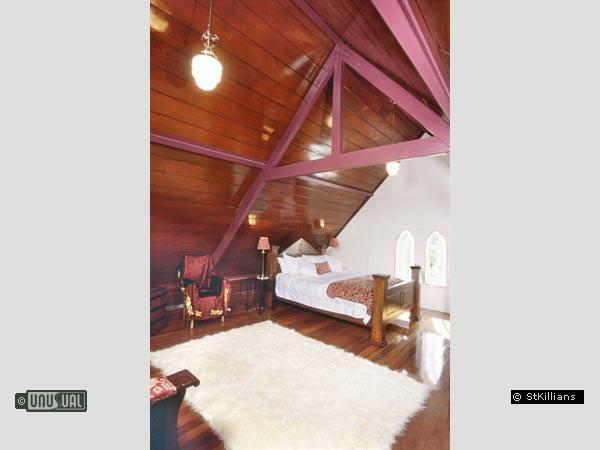 The Choir Loft bedroom is perfect for your romantic escape, furnished with a four-poster Bishop's bed, with warm, red cedar cathedral ceilings. The Vestry bedroom is our centerpiece room, featuring a 1920s queen-size brass bed to provide an impressive and private escape for you and your partner. " Exclusive use of the property, whether you stay as a couple, or share the second bedroom with friends, provides you with a luxurious, private and intimate break. 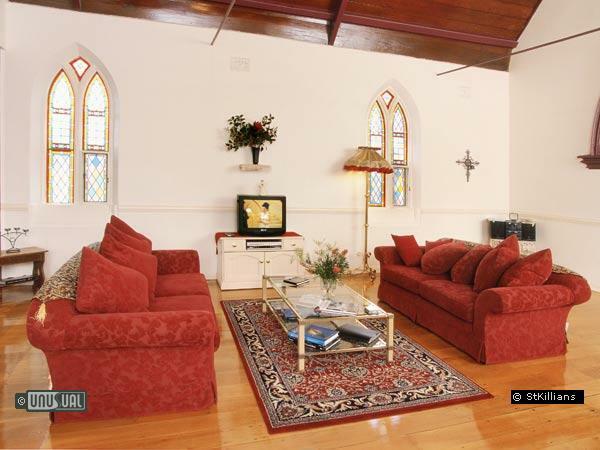 St Killians Church was built in 1879 and has a rich and prodigious history. 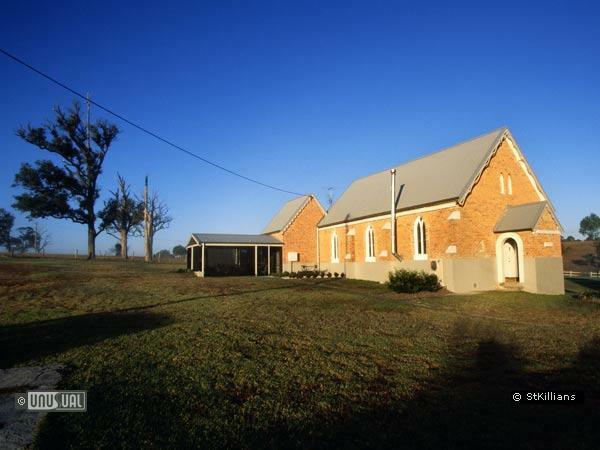 It was originally constructed to provide a religious safe haven and community focus for the farming hamlet of Brookfield in the Hunter Valley. The sand stock bricks were transported from England as ballast in tall sailing ships, reflecting the pioneering and venturesome spirit of our forebears. The historic hamlet of Brookfield was once a thriving farming community supporting a Cobb and Co Inn, two schools and five hotels. It also played host to the Brookfield picnic races for locals and visitors for many years (the last race being held in 1975). After serving the community for more than 100 years the church was closed and left to an undetermined future in 1982. We know your stay will be...heavenly. 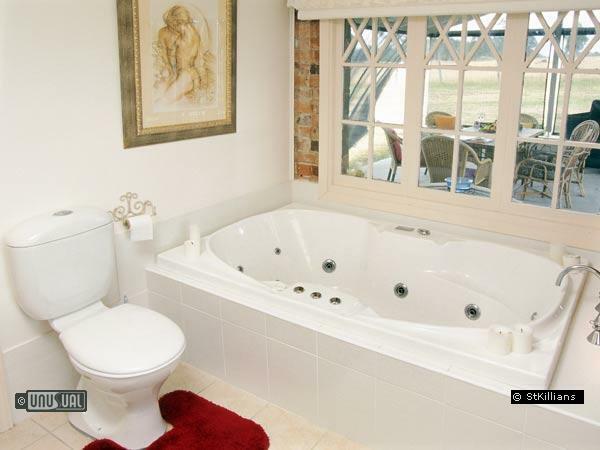 Relax in the luxurious bathroom in the double shower, two-person spa bath, hand-made bath products and hairdryer. 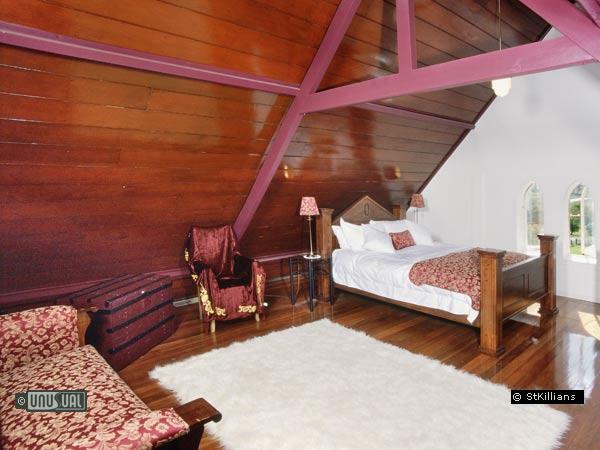 With fluffy towels, quality bed linen, electric blankets, TV/VCR/DVD/CD facilities, reverse-cycle air-conditioning, and numerous little extras - guests will enjoy luxurious appointments. Within the spacious open-plan living area is a sitting room where you can sit and curl up in front of a cosy wood fire, other features include feather lounges, a hand built refectory dining table where you can sit back and indulge on gourmet cuisine. 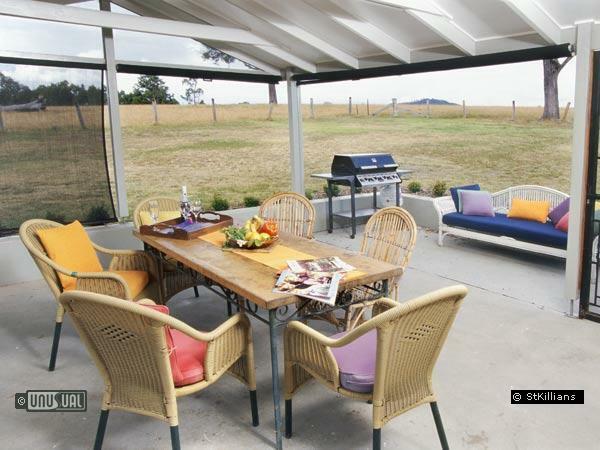 Outdoor dining is your choice of a private sun-drenched courtyard or a fully screened alfresco dining and barbecue area where you can enjoy the country and mountain views and unwind. Arrive anytime after 2pm on the first day of your stay. To ensure you enjoy the most of your stay, departure time is a leisurely 12 noon. Heavenly Hibernation package for self catering with gourmet breakfast provisions and supper and champagne on arrival. A romantic getaway, just two and a half hours' drive north from Sydney's CBD. Scenic drives, guided wilderness tours in a 4 wheel drive, bush walking, local boutique wine tasting, horse riding, carriage and picnic rides, Gourmet Cooking lessons with a five star chef, his and hers massages, hot air ballooning, antique shopping, tennis, food and craft markets and canoeing in the Barrington Tops heritage area are just some of the many activities you can enjoy… or just choose to relax and hibernate within this unique haven. Local weather conditions in the Hunter Valley are warm days cool nights. Brisbane Water National Park is about an hour from central Sydney. As well as being a preserved natural habitat and historic location, it offers spectacular views and scenic landscapes. The park has several cycling and fishing spots as well as a number of walking trails. Take flight in the world's newest activities! The Jetpack, The jet pack unit blasts hundreds of litres of water through specially designed thrust nozzles to enable you to fly as high as 15 metres above the water..